Yuriko is a Japanese name that causes embarrassment to a little girl at school when her new teacher pronounces it incorrectly. She wishes she has a plain regular name and decides to change her name for a day or two. During the story, though, she finds out why her name is part of who she really is. This is a wonderful story for all children to find out more about names. The children tease and bully her about her name and the fact that Japanese dolls all have black hair, while the hair on her doll and on her head is blonde. It is a wonderful multi-cultural story about how we can all fit in while still being different. 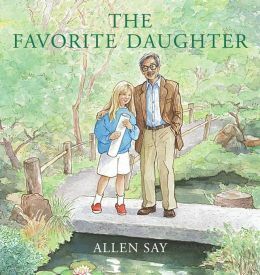 As a read aloud, it will strength understanding of how some families have different backgrounds from our own. It will give an opening for parents, teachers and librarians to discuss how we treat those who might have a different name or different kind of family than our own. Second grade and third grade readers will be able to read this story independently while younger ones will need to have it read aloud. It has beautiful illustrations and an interesting parallel story line about an art project that the author uses to strengthen the idea of individualism. The core curriculum requirements for many areas can be met using this book. It compares Japanese bridges with the Golden Gate in illustrations, the use of chopsticks, eating sushi and differences between languages with the illustration of Japanese ink painting. Extras: This book could be used in a geography or culture class when students are studying Japan and Japanese customs. The art project about the golden gate bridge can be changed to include any important structure in any community. The illustration of the Japanese ink painting can be used to spark projects of research or painting. There are also a couple of expressions in the Japanese language to intrigue students for future exploration.